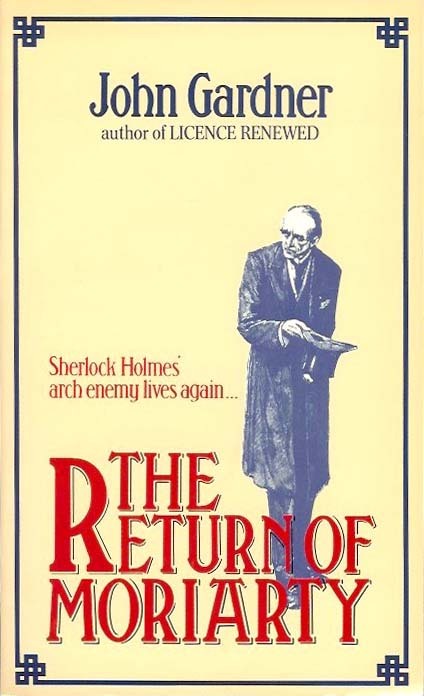 First published in 1974, this is a 1983 UK paperback edition of John Gardner's The Return of Moriarty. The cover refers to Gardner as the author of Licence Renewed, the first of 14 original James Bond novels. Gardner would also pen a sequel, The Revenge of Moriarty. An evil genius never dies. The sworn enemy of Sherlock Holmes is back, manipulating turn-of-the century unrest to his own deadly advantage. From the murky haunts of Limehouse, punishers, forgers, cash-carriers, cracksmen, blackmailers, murders and Moriarty's whore-mistress, the celebrated Sal Hodges, carry out the will of the Napoleon of crime. How far do the tentacles of evil stretch? What was the connection between Moriarty and Jack the Ripper? Or the famous de Goncourt case in which the Metropolitan police first faced charges of corruption in court? The answer for Inspector Crow, sworn to bring Moriarty to justice, lie deep in the labyrinthine darkness of the Victorian underworld. "Somewhere in the vaults of the bank of Cox and Co., at Charing Cross, there is a travel-worn and battered tin dispatch-box with my name, John H. Watson, M.D., painted upon the lid. It is crammed with papers, nearly all of which are records of cases to illustrate the curious problems which Mr. Sherlock Holmes has at various times to examine." Original content © 2014-2019 John Cox. All rights reserved. Simple theme. Theme images by caracterdesign. Powered by Blogger.